There's a song they play during the seventh-inning stretch at baseball games, and it isn't called "America the Mediocre." The wonders of this country are as vast and varied as the people who inhabit it, be it a towering skyline or remarkable feat of engineering, a mountain lake or iconic stretch of coastline, an otherworldly desert scape or a redwood forest bathed in fog. Every state (and/or Commonwealth!) 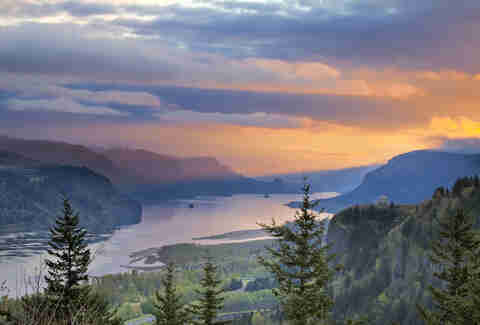 has its own gems to contribute, which is why we polled residents and tourism boards across the country to determine the must-hit, must-Instagram, most beautiful place in all 50 states. As the US passes another birthday, what better way to celebrate than seeing all these bad boys on a proper Great American road trip? Data scientist and dude we’d definitely let ride shotgun Randal Olson ran our picks through a rad algorithm to find the optimal, shortest route by road across the lower 48 (Hawaii and Alaska, arguably the most stunning states, are sadly less than geographically conducive to road trips). Not accounting for traffic, seeing the best of the US will clock you 10.2 days at 14,750 miles. And there’s really no telling how many thousands of beautiful runners-up you’ll spy along the way. It’s been said that the Florida Panhandle is basically East Alabama. 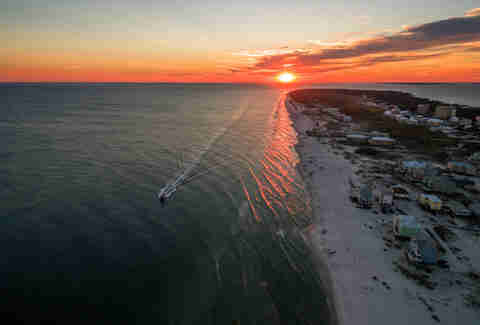 And, yes, that extends to the alarmingly high rate of jorts and "#3" stickers, but also to the gorgeous beaches; this tiny town on Alabama’s Gulf Coast is on par with any you’ll find in the Sunshine State. One of America’s best small beach towns is also home to the annual Hangout Music Festival. The Grand Canyon is an obvious one, so let’s get a little more granular, shall we? 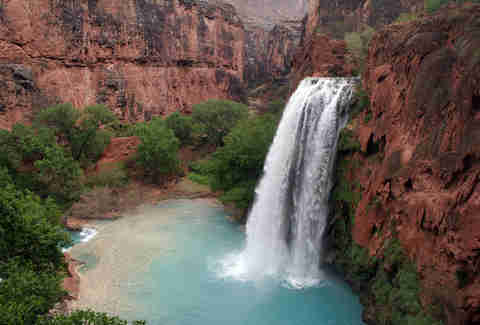 The turquoise falls in the Havasu Canyon (found in the Western part of the Grand Canyon) is the kind of sight you’re only used to seeing with the help of CGI. It’s a spectacular 100-foot drop into blue-green pools surrounded by the equally impressive Navajo, Mooney, and Beaver Falls. 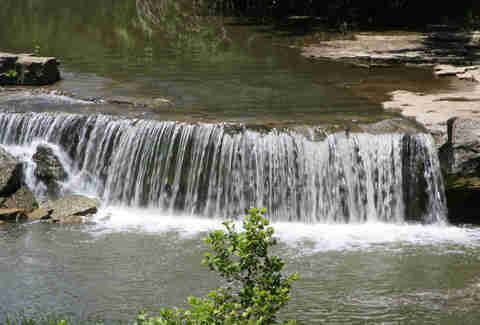 The Ozark Plateau in north Arkansas is simply too damn old to give hikers the vertigo that you’ll find in the Rockies. 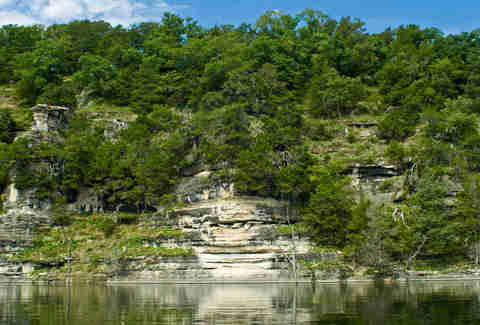 What you do get around the Buffalo River and its valleys -- the first National River ever designated -- is a sense of bluff-enclosed comfort that suits the personality of the state: humble, undeveloped, and super-effing pretty. 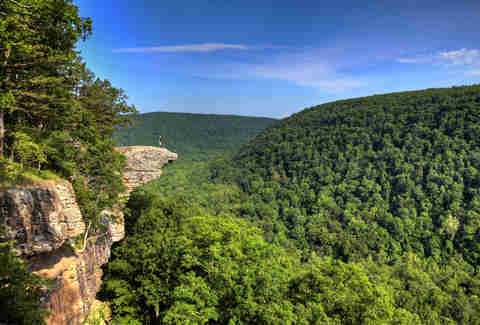 The literal standout of the area is Hawksbill Crag, cover model for many a calendar and hiking guide, an erratic cantilever that dangles you out over the valley. It’s how humble goes straight to whoaaaah. 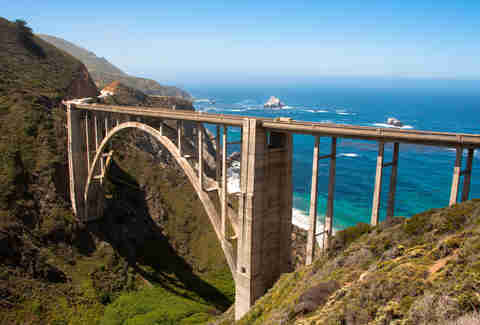 In a massive state with pretty much every type of landscape you could name, the most breathtaking is Big Sur along CA-1, where the majestic cliffs drop into the Pacific creating perhaps the most postcard-worthy sunsets in America. Tip: As you road trip through here, make sure you’re the passenger. Highway 1 has more twists than a season of Scandal, and you don’t want to be looking at asphalt instead of ocean. Yes, once upon a time people went to Colorado for crazy stuff like skiing and scenery instead of... well, why do YOU go to Colorado? 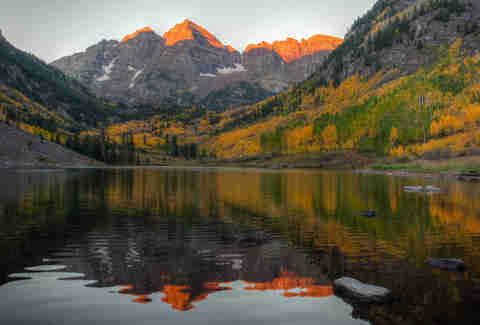 This pair of jagged mountain peaks that tower above serene Maroon Lake outside of Aspen has been dubbed the most photographed place in the state. 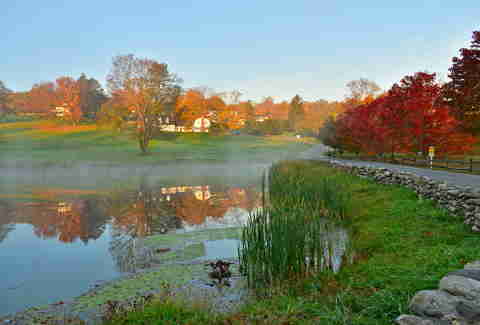 Few can rival the fall foliage that blazes red and orange in the hills surrounding this little Connecticut town near the New York border. 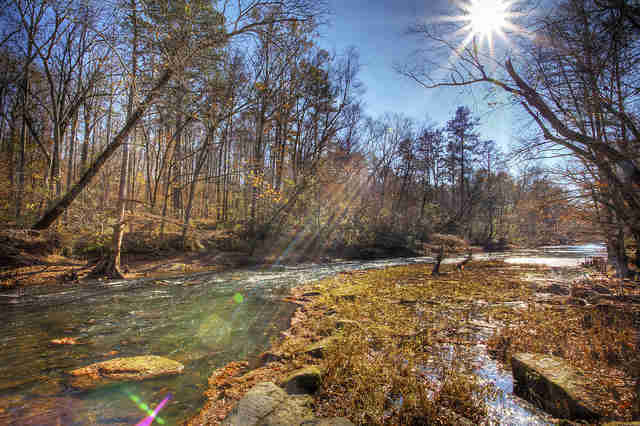 The Kent River makes for postcard-worthy scenery any time of year, especially near the historic Bulls Bridge, and further north you’ll find the serene Kent Falls. 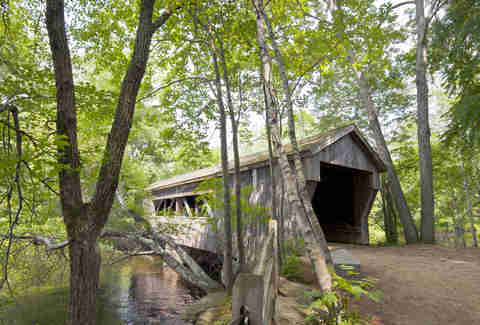 A bike ride through the hills along the nearby Appalachian Trail is the best way to take in all of the area’s scenery. 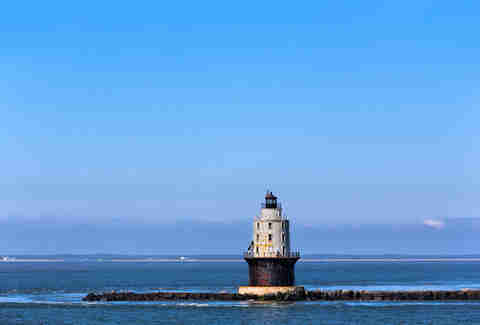 That image of the Harbor of Refuge Light lighthouse in the middle of the clear blue ocean, white sand dunes in the foreground, is one of the most iconic scenes of the First State. And certainly a summer afternoon spent on the sand or biking through the wildflower-lined paths is one of the most scenic experiences in Delaware. 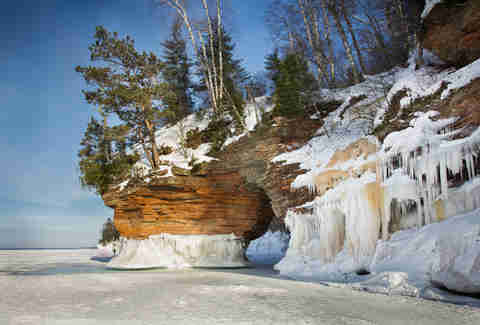 But winter is when this place gets really special, when a layer of white snow covers the sandy beach creating a surreal, colorful spectacle that’s worth braving the cold for. If we were aiming for an all-out comment war, we’d pick a beach like Sanibel or Ana Maria and invite the indignant fans of Port St. Joe to go ballistic, much as they did in the comment section when we rated the top beaches in Florida. 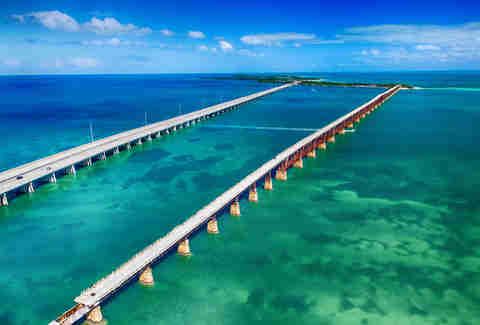 To avoid that, we’re going with this impressive feat of engineering, a seven-mile concrete stretch in the Keys that connects Little Duck Key and Knights Key. Simply, it offers the most impressive panoramic view of the islands and Moser Channel. Also, fun facts: the original was once part of the overseas railway, but it was actually a model of the bridge that was demolished during the filming of the Schwarzenegger​ flick,True Lies. 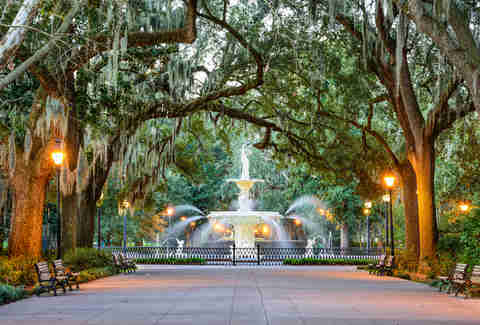 Spanish moss-draped live oaks, sunlight-dappled public squares, stately Victorian homes... that’s not only the most beautiful place to be in Georgia, but one of the most beautiful towns in the South. 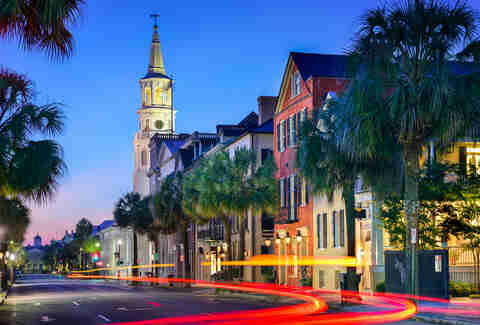 Which explains why Forrest Gump’s famous bench is in Savannah’s historic district, and other movies like Midnight in the Garden of Good and Evil, Glory, and The Longest Yard were filmed here too. Ask a hundred different Hawaiians to pick the most beautiful point in the state, you’ll get 100 different answers, and they’re all correct. 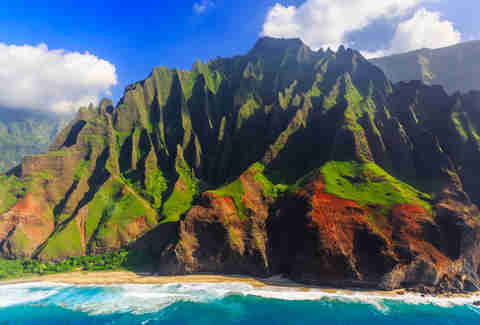 What distinguishes this far coast on the ancient island of Kauai (6 million years older than parts of the still-erupting Big Island) are those ridiculous hues and the drama of the drops. Eons of earthquakes have sheared off parts of the mountains, leaving you to hike on winding trails that hug cliff faces and plunge down to opalescent beaches. Watch a sunset from hundreds of feet up, with nothing between you and China but 5,000 miles of Pacific Ocean. It is, in a word, ridic. 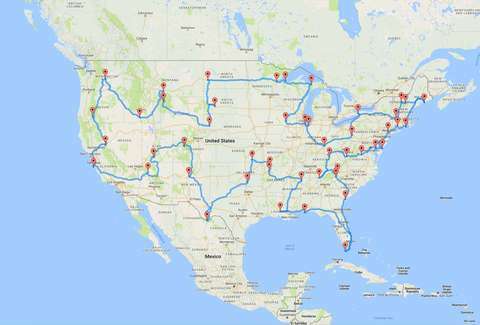 [Editor’s Note: Hawaii is not included in the above road trip, because duh]. With all due respect to the blue field at Boise State, this Idaho behemoth stands tall at 212ft (Niagara Falls, by comparison, is only a buck 67) and is fed by one of the most challenging whitewater rivers in the country, the Snake River. Don't miss it, even to visit that field. 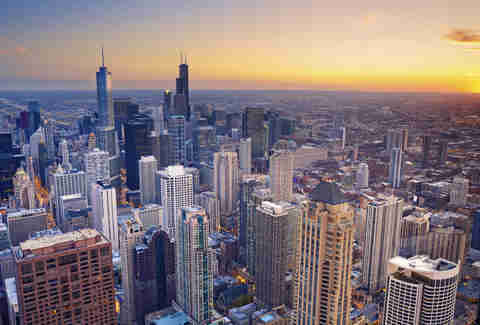 Combining both natural and man-made beauty, it's tough to compete with the view from the highest point in Chicago, the Willis Tower, for title of most beautiful spot in Illinois. Not only can you appreciate Lake Michigan and the rest of the Windy City from one of the world's most premiere observation decks, but you can even enjoy a stuffed-crust pizza while you're up there! Indiana is known for a great many things. Basketball? Sure. Auto racing? Absolutely. Regular season NFL football? From September until the second round of the playoffs, Indiana is the place. But beaches?! Yes, believe it or not, this three-mile protected stretch of beach along Lake Michigan is one of the best on the Great Lakes, and is a summer destination spot for Midwesterners looking to camp, hike, cycle, or just work on what will eventually just have to pass as a tan. People who think Iowa is nothing more than the birthplace of high-fructose corn syrup have probably only seen it from the window of an airplane. The state has A LOT more to offer than just cornfields, like this park in the “Driftless” region. 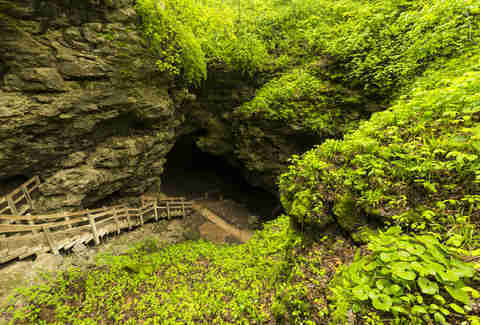 Turns out, glaciers didn’t wipe everything out during the last ice age, and these limestone caves (and the green wilderness around them) remain. So while the rest of Iowa might be as flat and corn-filled as you learned in fifth grade, this section looks more like the Pacific Northwest. When all you’ve got to work with is prairie, you better make it count. 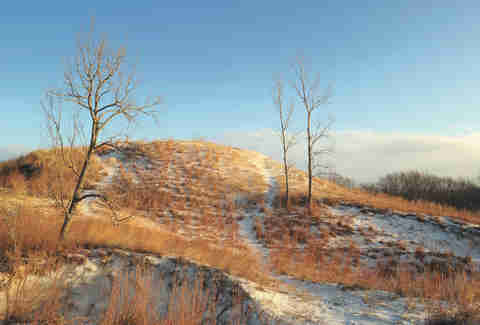 And the Flint Hills -- the largest stretch of tallgrass prairie land in the world -- don’t disappoint. This swath of rolling hills stretching between Wichita and Manhattan are dotted with more than 800 different types of wildflowers, creating an impressive daytime tableau of color against the big blue sky. The hills kick things up a notch when the prairie burns in spring -- lit to rejuvenate the grassland -- and kicks up gorgeous colors at sunrise and sunset. If you happen to catch the hills right after a thunderstorm, you’ll begin to appreciate the natural beauty of America’s breadbasket. 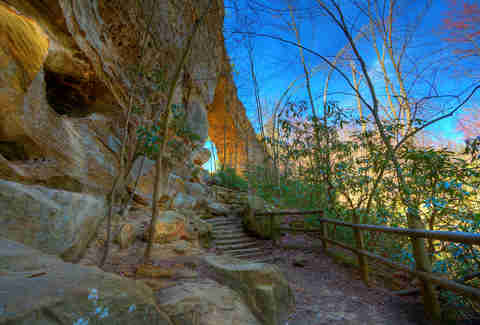 In the heart of the Daniel Boone National Forest sits the Natural Bridge State Resort Park, a 2,300-acre swath whose main draw is this 78ft-long, 68ft-high sandstone bridge. The arch was actually created naturally over years of erosion, and while it’s certainly the highlight, Natural Bridge also includes over 20 miles worth of trails and Balanced Rock, which looks vaguely like the Egyptian Sphinx. If we're to believe the History Channel, the people who inhabit Louisiana swamps aren’t what might classically be defined as “beautiful.” But it's the landscape that counts, and here we've got the largest wetland in the United States with 1.4 million acres of mangroves, alligators, and migratory birds. 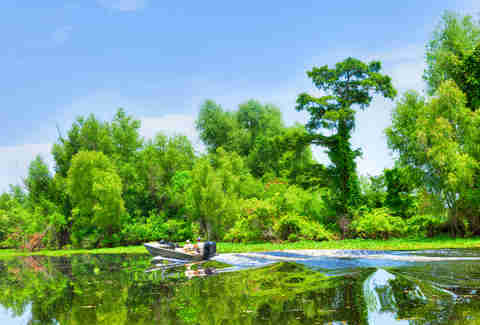 In fact, the cypress-tupelo swamps are actually the largest contiguous stretch of coastal cypress in the nation, providing welcome shade should you opt to see this area by airboat. The oldest national park East of the Mississippi -- and hands down the best tourist attraction in Maine -- Acadia is 47,000 acres of New England beauty. 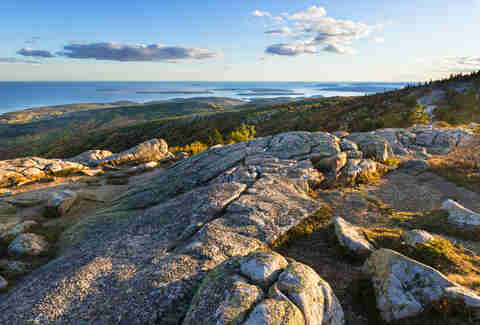 But to visit the most scenic spot in the state, you’ll need to climb to the top of Cadillac Mountain. It not only offers visitors one of the best sunrises over Frenchman Bay, but also one of the earliest; the park is among the first spots in America to get daylight. 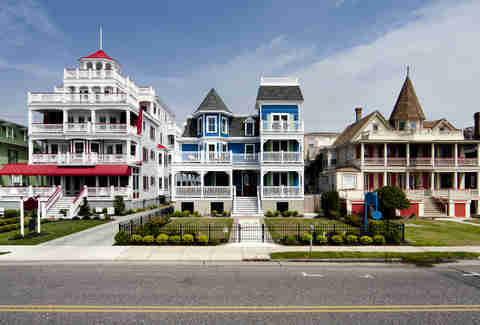 The eastern shore of the Chesapeake Bay boasts some of the best waterfront scenery in the Mid-Atlantic, and drilling down to one particular “best” is tough business. But St. Michaels takes the title for a few reasons. 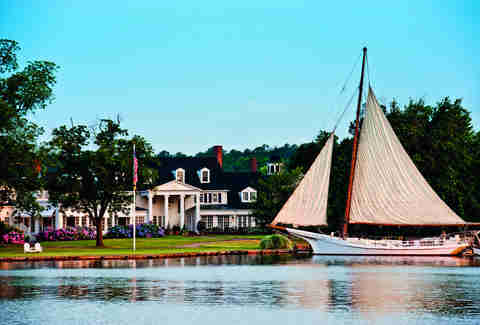 First, it has the abundance of sailboats dotting the bay that make for a quintessential Maryland seascape. Second, the Downtown is full of quaint colorful shops that lead to the waterfront lighthouse at the Chesapeake Bay Maritime Museum. It’s also home to the Inn at Perry Cabin, one of the most lovely hotels in the country, known to most of our generation as the setting for Wedding Crashers. Drive through this part of scenic Western Massachusetts in early October and it looks, as one Thrillist editor put it, “like fall created a giant tifo display made from leaves” (A tifo, if you don’t watch soccer, is one of those big posters they unveil before games). 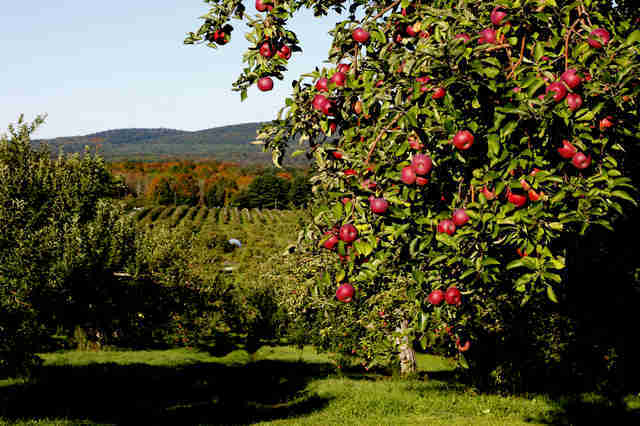 It's a combination of vibrant fall colors and quaint New England charm that causes peepers from all over the country to descend on the region every autumn. If it weren't for the unmistakeable scent of Michigan pine forest, you could be forgiven for looking out over Lake Superior from Pictured Rocks and mistaking its alluring blue-green waters for the Caribbean. Though Miner's Castle is the most iconic vista, this National Lakeshore on the northern edge of Michigan's Upper Peninsula stretches for 42 miles of untouched coastline, made up of remote beaches, hundreds of miles of backcountry trails, and dramatic 200-foot cliffs that were chiseled over time into caves, archways, and the occasional castle-like turret. In a state with more than 3,000 miles of coast (second only to Alaska), this is its best part of it all. 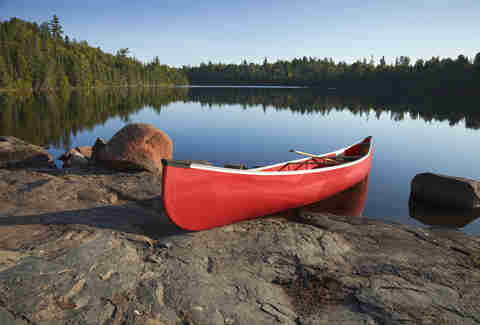 While our first inclination was to go with “grape salad,” the good people at Explore Minnesota advised against that, recommending the Boundary Waters Canoe Area instead. This MILLION-plus acre area of natural waterways in the Superior National Forest restricts motorized access, allowing for peaceful exploration along the 1,500 miles of canoe routes that run through a bunch of the state's 10,000 lakes. Though some suggested the Jackson Volcano, that’s actually located beneath 2,900ft of sedimentary deposits and the Mississippi Coliseum. And since we’d be remiss sending you to something you can’t even see, instead we suggest this park in the foothills of the Appalachians. Not only is it full of waterfalls, massive rock formations, and fern-filled crevices, but it’s also part of the famous Natchez Trace Parkway, possibly the most scenic drive in the American Southeast. “Paradise” is obviously a relative term. And if your version of paradise involves palm trees and cocktails served in coconuts, you’d obviously steer clear of Montana. However, if your definition includes monumental glaciers, crystal-clear rivers, deer prancing in meadows, and big blue skies, then this is indeed your version of perfection. 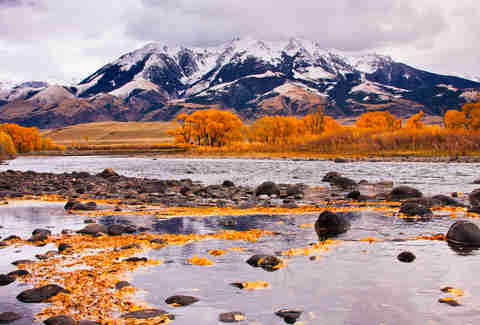 This area just North of Yellowstone Park sits between the Absaroka and Gallatin mountain ranges, and is one of the world’s premiere destinations for fly fishing. While Chimney Rock might be the top tourist destination in Nebraska, it is only ONE rock. 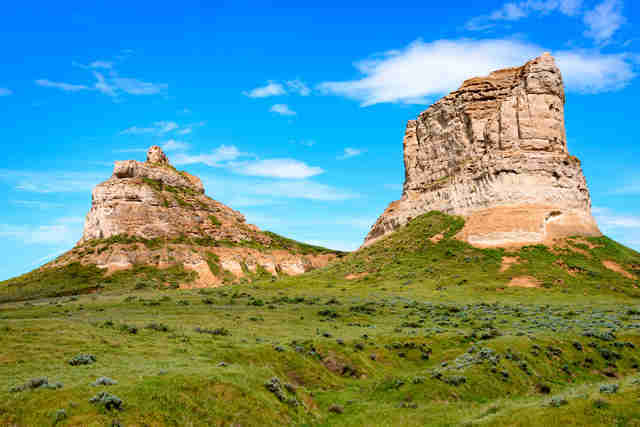 But if you want TWO impressive, towering natural structures made of clay sandstone and ash (and, of course, you do), you’ve gotta head to the panhandle and see these two outcroppings (historic landmarks along both the Pony Express and Mormon Trail) rise up from the North Platte Valley. Ask any dude who’s spent one night too many in Vegas, and he’ll tell you the prettiest place in this desert state is inside the Crazy Horse. 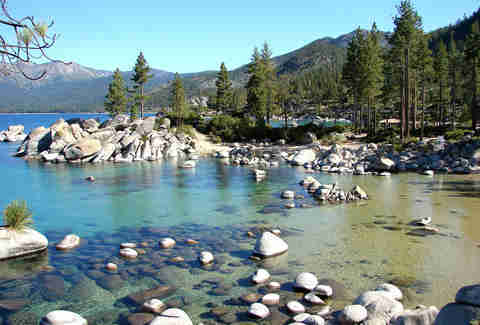 But that’s why you don’t ask THAT guy, and instead call the Visitors Bureau, where they'll unanimously inform you it's Lake Tahoe. The best views can be had from Incline Village in the North, or from the top of the slopes at Heavenly. Which, in addition to its spectacular views, also provides access to one of the best party mountains in America. Though the trip up one of the highest points East of the Mississippi is possibly the best way to take in New England’s fall colors (the other, obviously, being that drive through Western MA), that might be the last time of the year you’d want to go here; temps can get as cold as negative-102 degrees with wind chill, and the summit once recorded a wind gust of 231mph -- the fastest ever recorded on Earth at the time. A popular spot for whale watching, this island and its collection of towns with the name “Wildwood” also boasts quiet beaches, boardwalks, a roller coaster, and all the other stuff you’d expect on the Jersey Shore -- just instead of loud music and IROC Camaros, there’s birdwatching, English gardens, and a historic lighthouse. 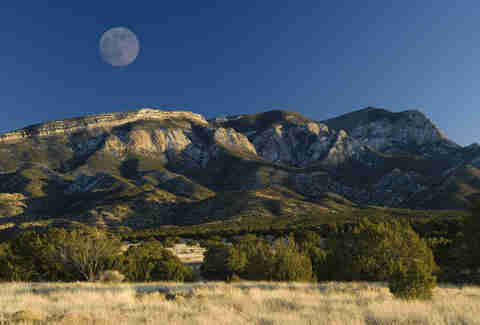 Sandia means "watermelon" in Spanish and after you witness the gorgeous sunset here -- during which the mountain range glows a vibrant pink -- then you'll understand how the name came to be. From the top, you can see 11,000 square miles of meth labs and probably the spot where Hank’s body was buried. JUST KIDDING NEW MEXICO!!! You can also see some state landmarks more than 100 miles away. Yes, this pick was only slightly less predictable than every NBA season from 2004-2014. And since Manhattan’s skyline might be the only thing in New York more overrated than its bagels, can you think of a spot in New York that’s MORE scenic? 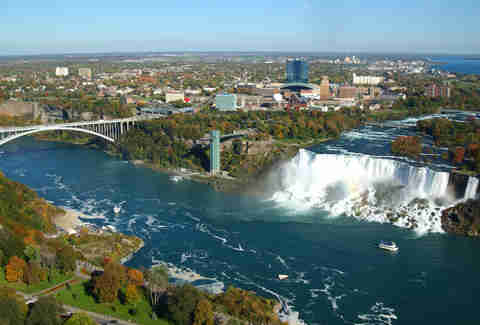 Niagara Falls is an easy choice: a 167ft drop that drains one Great Lake into another and separates us from our friendly Canadian neighbors. It may well be the most famous waterfall in the world, and has been the site of more wedding proposals than probably any spot on the planet not named "Las Vegas at 4am." Yes, there are some picturesque beaches on the Outer Banks, as well as lighthouses like the Cape Hatteras that are among the most visited in America. And the Smoky Mountains ain’t bad, either. 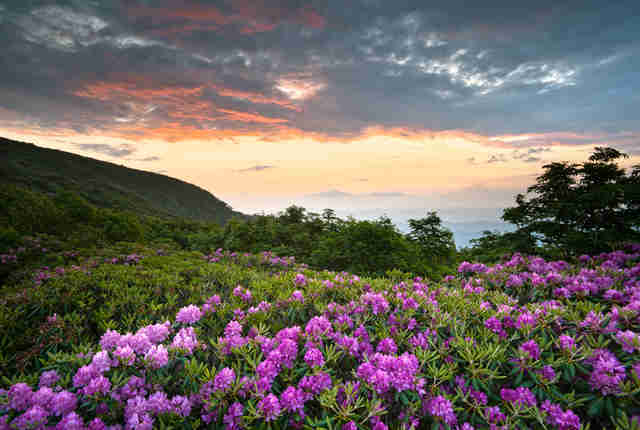 But perhaps the single most scenic place in North Carolina is the gardens off the Blue Ridge Parkway, recognized by the state as a National Heritage Area. Here, wildflowers give way to exposed bald rocks and some of the most gorgeous mountain views in America. 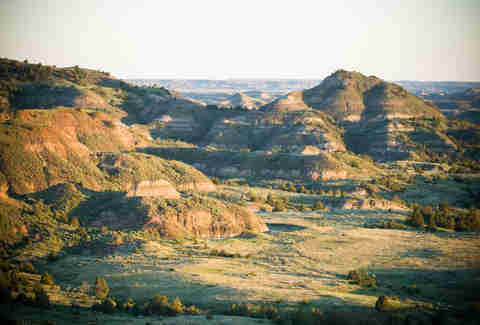 Not only is Theodore Roosevelt the coolest dude from New York who charged up San Juan Hill like a damn lunatic, but he's also the founder our national park system and donated parts of his own ranchland to Theodore Roosevelt National Park. Today, the visitor center overlooks North Dakota’s Painted Canyon and the rest of the North Dakota badlands, and the view is almost as insane as TR was when he ordered that attack in Cuba. City views are nice. Ancient caves are pretty cool. But what if we could put them both... IN THE SAME BUILDING? 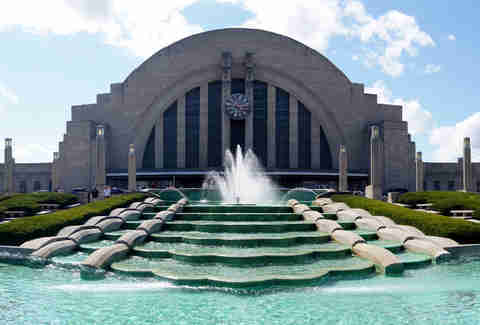 In the greatest cultural advance Cincinnati has given the world since the Ickey Shuffle, they’ve done just that at this museum in the old Union Terminal, as multiple museums feature large-scale models of the city and replicas of ancient caves that you can actually walk through. Adding to the scenery of this spot on the National Register of Historic Places is the grand, Gilded Age architecture that denotes an old-school rail station. The best song ever written about Oklahoma clearly didn’t appreciate the contribution of the Choctaw Nation as much as it should have. Bingo, sure. But not this park, which was originally part of the area where the tribe was re-settled and found to be flush with hot springs and healing waters. 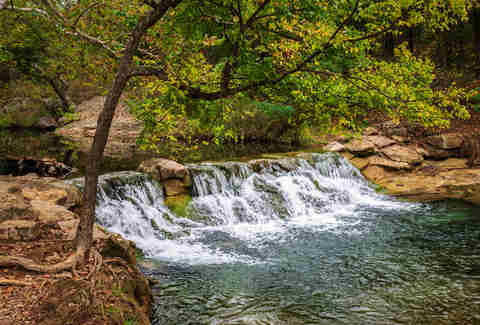 Fearing developers would come in and make it the next Bathhouse Row, the Choctaw sold it to the federal government and it was turned into a national park, which was eventually incorporated into the bigger Chickasaw Recreation Area along with scenic Arbuckle Lake and Travertine Creek. 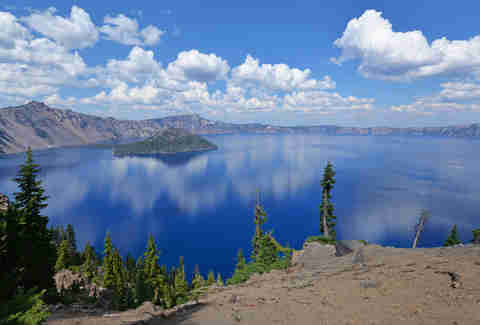 Even though almost half of Oregon is forested, and the state boasts beach rocks cool enough to be featured in Goonies AND Point Break, the most scenic spot is still Crater Lake, the deepest in America. It was created when Mount Mazama collapsed thousands of years ago. Though some might argue that the most scenic spot here is the “Welcome to Pennsylvania” sign you see when leaving Ohio, the most postcard-worthy place is the view from the top of the Mount Washington neighborhood outside Pittsburgh, from which you can look out on one of America’s best skylines and the valley where the Allegheny and Monongahela Rivers join the Ohio. The Ocean State’s finest place to see the ocean. 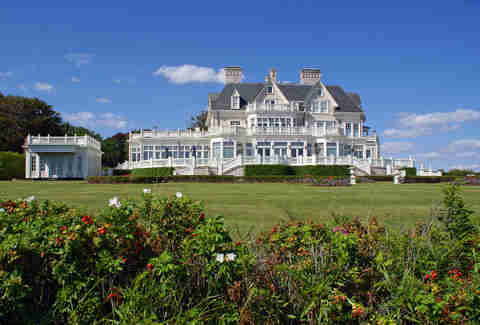 In this playground of 1-percenters, impeccably preserved Gilded Age mansions sit atop seaside cliffs more reminiscent of Malibu than New England. The city’s natural beauty is just as impressive as its architecture and a big reason why the wealthy flocked to Newport for a seaside escape more than a century ago. The Palmetto State has no shortage of coastline to ooh and aah at, but overlooked, in the northwest corner of the state, the vistas around Caesars Head rival many in the Smoky Mountains. The 420-foot Raven Cliff falls is one of the most underrated scenic waterfalls in America, a worthy reward after the tough hike to get there. But even the lookout points over the hills at the visitors center are undoubtedly the best place in SC to watch a sunset. It’s one of the most alien-planet formations anywhere -- a collection of canyons, jagged edges, and mountains as colorful as their name. 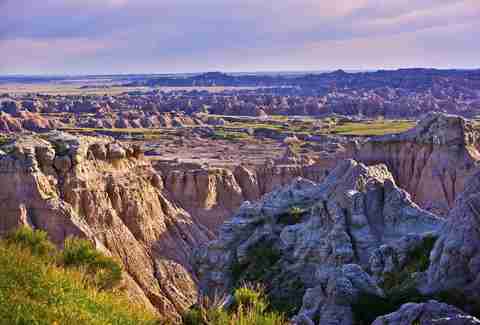 The Badlands are every bit as awesome as the Grand Canyon, a desert landscape that turns a dozen shades of orange and red, where more than a few flailing souls have come to go on their version of a vision quest. 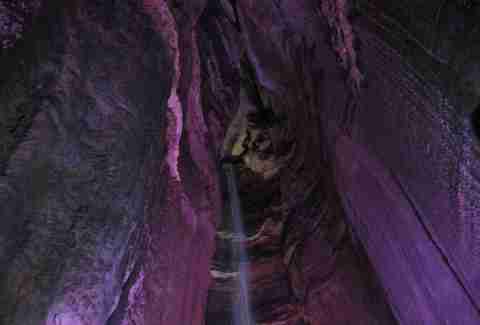 The most scenic place in Tennessee is actually underground. No, not the TV room at Graceland (though Elvis might argue for that one) but this 145ft waterfall that sits 1,100ft under Lookout Mountain. And while the Waiahuakua Sea Cave in Hawaii might be a little more scenic, this is the deepest waterfall in America that’s open to the public. 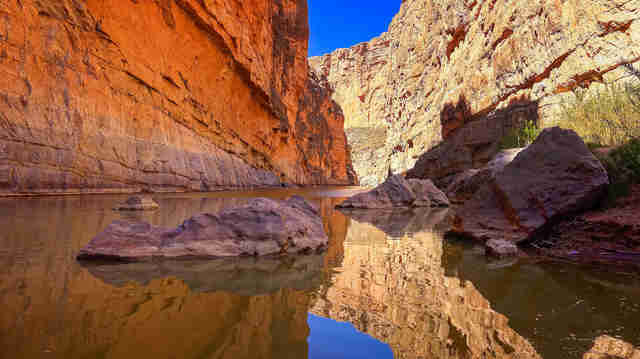 The best way to experience this 1,500ft-deep canyon is by rafting through it along the Rio Grande. The river’s most notable feature: the Rock Slide, a Class IV rapid considered by some to be the most challenging whitewater in America. 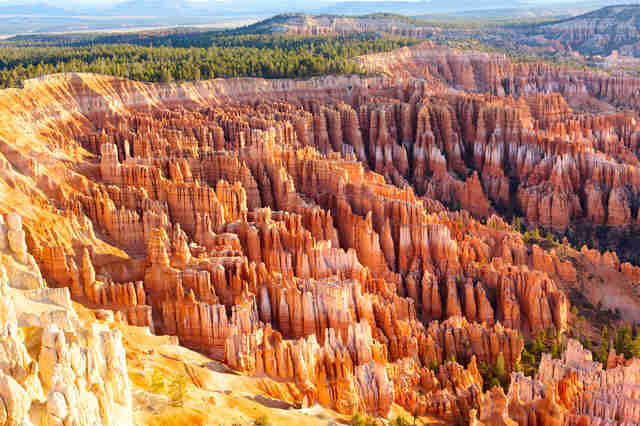 As impressive as the collection of red rock natural amphitheaters that make up Bryce Canyon are, what may make this park even more impressive is how it looks in the dark. No, you can’t see the geologic formations, but you can see stars. Billions of them. Which make this site the most beautiful in Utah 24 hours a day. 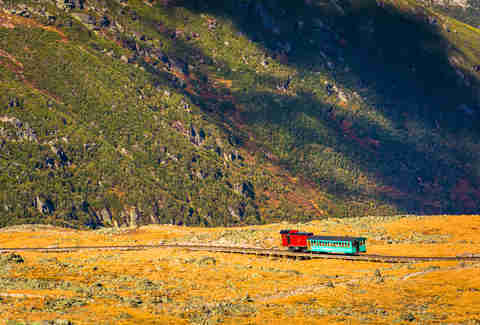 The far Northeastern section of Vermont -- often referred to as NEK -- represents New England wilderness at its finest. In this area revered by residents and visitors alike for its untouched countryside and fall colors, moose still roam wild among mountain lakes and lush forests. Consider it some of the most peaceful country in America. 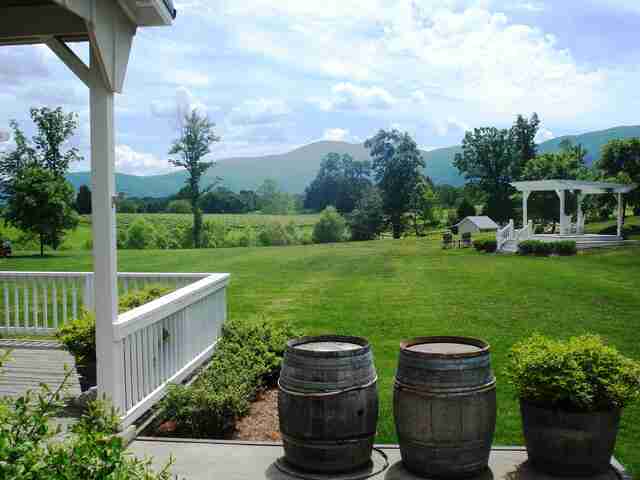 Once California completely runs out of water, look for every bachelorette party, girls’ weekend, and Thomas Keller restaurant in America to shift here, to Central Virginia and the most scenically impressive wine country on the East Coast. Though not as temperate as Napa, this picturesque region boasts wineries, rolling hills, and the Blue Ridge Mountains off in the background. The views are almost as good as the viognier, the grape this area is beginning to claim as its own. Even though Washington boasts two of America’s top 20 national parks and America’s best skyline, the most scenic place in the state is probably better known for KUBE 93’s Summer Jam than for the scenery. 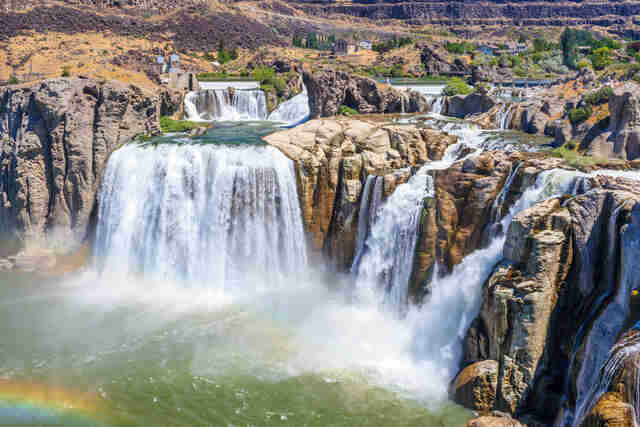 That’s because this river gorge in central Washington has some of the best amphitheater acoustics in the world, and is the famous home to The Gorge at George and its lineup of summer concerts. Get there a few hours before the sun goes down and enjoy the most scenic tailgating you’ll ever experience. 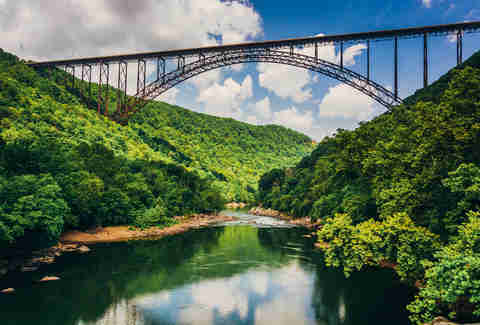 The highlight of the year in West Virginia is Bridge Day, where denizens of this state (and several others) gather at the bridge over this gorge to hurl themselves towards the bottom attached to things they pray don’t break. And if they do? Well, at least their last view was of this stunning river, which winds through towering rock formations with names like Endless Wall and Junkyard Cliff. While just hearing the words “scuba diving in the Great Lakes” may have you quoting George Costanza, if you own a REALLY thick wetsuit, the clear waters of Lake Superior at Apostle Islands might be the best cold-water diving in the country. Here you’ll see underwater rock formations unlike any found in warmer waters, as well as some notable Great Lakes shipwrecks. And if you’re not dive certified, the lakeshore has eight historic lighthouses and 240 species of migratory birds for your above-water viewing enjoyment. 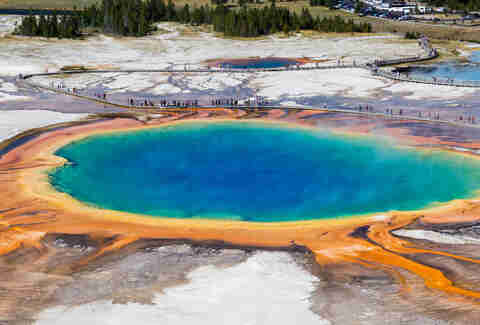 About 200 years ago, some fur trappers were trekking through Wyoming and stumbled on what they described as a “boiling lake.” But “rainbow lake” would probably be more accurate, as the colored bacteria near the water made it look like a turquoise pond surrounded by a rainbow. 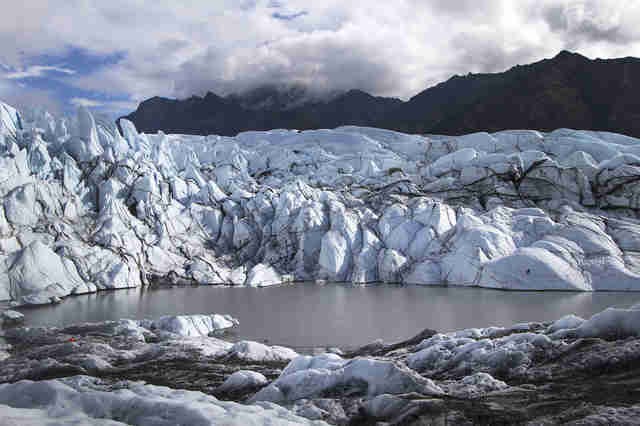 It’s the third-largest hot spring in the world and the largest in America. It's also definitely the only one that looks like it just came from one of those REALLY fun high school parties you never got invited to. 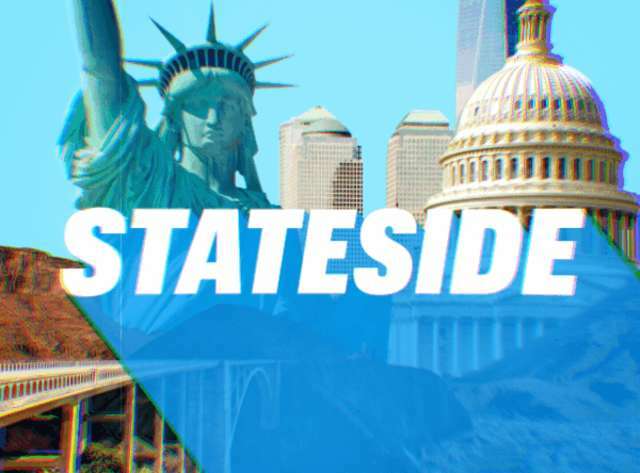 Matt Meltzer is a contributing writer to Thrillist who'd love to hear why he got your state "totally wrong.” Follow his road rage on Instagram @meltrez1.